Surrounded by the chic boutiques and renowned restaurants of Homewood, Alabama, Aloft Birmingham Soho Square is the urban oasis you've been seeking. Designed with the jet set go-getter in mind, we offer free high-speed Wi-Fi so you can plug in and stay connected while you recharge. The moment you step into our tech-infused hotel, you'll be enamored by our buzzing lobby while your pet is welcomed with a tail-wagging treat. Because we know you will be busy during your stay, our self-serve gourmet snack bar serves health-conscious grab-and-go meals 24 hours a day. Retire to our open, loft-inspired rooms, where you can take advantage of complimentary bottled water, mini-refrigerators and pay-per-view movies before hitting the sheets. After indulging in a restful night of sleep on our plush platform beds, you'll want to hit the snooze button a few more times. With live music performances, a lively lobby bar and ultra modern accommodations, Aloft Birmingham Soho Square is an experience worth reserving. Michael's Steak & Seafood Restaurant: The New Steak and Seafood Home in Homewood, Alabama! 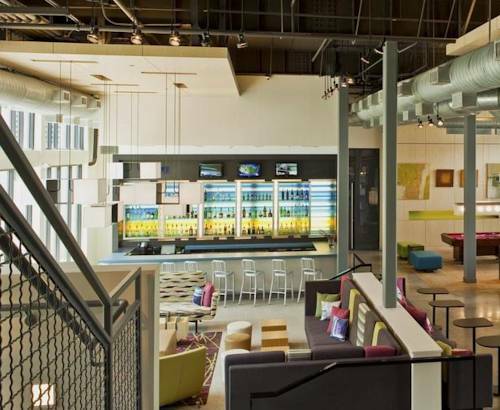 Re:fuel by Aloft: Get your foodie fix any time of the day at Re:fuel, our trendy, 24-hour snack bar. This tech-savvy restaurant concept offers gourmet grab-and-go meals and make-your-own cappuccinos so you can enjoy health-conscious snacks on your own schedule. W XYZ Bar: The buzzing ambiance of our mid-century modern bar sets the scene for a round of pool and drinks. With live music performances and an inviting lounge, W XYZ is more than a bar. It s a can't-miss experience during your stay in Homewood, Alabama.